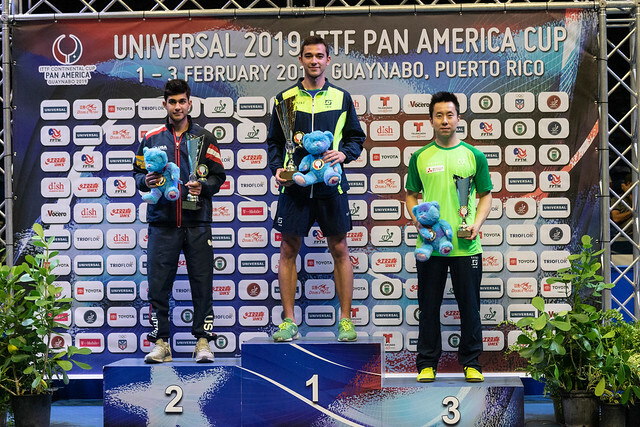 Defeat for Marko Medjogorac but there was plenty of reason for smiles on Canadian faces as the morning session of play in the group stage of proceedings came to a conclusion on Friday 1st February at the Universal 2019 Pan America Cup in Guaynabo, Puerto Rico. Jeremy Hazin followed by Alicia Cote both upset the order of merit. Star of the show was Alicia Cote, the no.14 seed; she recovered from a two games to nil and three games to one deficit to beat the host nation’s Melanie Diaz, the no.8 seed (7-11, 8-11, 11-3, 9-11, 11-5, 11-7, 11-7). A fighting performance from Alicia Cote, it was a command performance from Jeremy Hazin; the no.16 seed, he accounted for Chile’s Gustavo Gomez, the no.8 seed, in four straight games (11-6, 11-5, 11-7, 11-9). Success for Jeremey Hazin, the win coming soon after colleague Marko Medjogorac, the no.13 seed, had experienced defeat at the hands of home favourite, Brian Afanador, the no.7 seed. The young man from Utuado, an hour’s distant from Guaynabo was in no mood for charity; he recorded a straight games win (11-3, 11-8, 11-6, 11-8). Disappointment for Chile in the defeat of Gustavo Gomez but there was success; in the women’s event the ever present Paulina Vega, the no.7 seed, overcame El Salvador’s Estefania Ramirios, the no.16 seed (11-9, 11-6, 11-6, 11-3).